Madonna has been a divisive figure as of late, as she continues her provocative music career well into her fifties. However, her film career has been a particular sore point for many. Her second directorial feature 'W.E.' changes little for those naysayers, yet her take on the story of Wallis Simpson and King Edward VIII is at the very least intriguing. Following up from Madonna's 2008 directorial debut 'Filth And Wisdom', 'W.E.' also features Madonna's penmanship, a co-writing effort with Alek Keshishian. The two had worked together on a 1991 Madonna documentary ('In Bed With Madonna'), which at the time, was the highest grossing documentary ever. The duo have constructed a tale of two women - Wallis Simpson (portrayed by Andrea Riseborough) and Wally Winthrop (Abbie Cornish), whose turbulent love lives reflect a fragility and a need for acceptance. 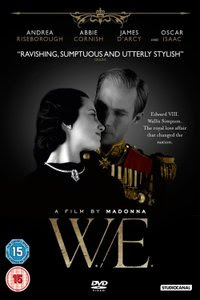 The film intercuts between Simpson's scandalous romance with King Edward VIII in the past and Wally's troublesome marriage in the present, effectively paralleling one another. Wally's obsession with Wallis borders on the melodramatic and is perhaps more of a distraction to the film than anything. The story of Wallis' point of view is one that has not been told in such a mainstream manner before, and this is the strand of 'W.E.' that proves most vivid. The film explores her sacrifice, contrasting it against the widely held view of her selfishness. Unfortunately the decision to have these two characters interact is a significant mis-step in proceedings, muddling the otherwise palatable parallel clumsily. While the acting is uniformly competent, special mention must go to Arianne Phillips and her dizzying array of costumes. Indeed, she was nominated in the Best Costume Design category for an Academy Award. Similarly, the production design is impressive, although not quite on the scale of 'The King's Speech', which this film acts as somewhat of a companion piece. The over-exuberant dolly and crane shots often detract from the positive however, and there are often anachronisms such as a punk rock track jarringly soundtracking a scene set decades before that type of music emerged. The film's end credits track is the first obvious appearance of Madonna, dubiously entitled 'Masterpiece' - perhaps trying to suggest something to the viewer about the film's quality. 'W.E.' falls far short of that label. Almost certainly, 'W.E.' has suffered from the presence of its high profile director. Less so in terms of its actual delivery, and more so in terms of Madonna's perception. She may have hoped that critics and audiences alike would be able to look past her previous efforts but alas, this hasn't been the case. While 'W.E.' intercut narrative is flawed, Madonna's second directorial effort proves to be a pleasant surprise. Her name alone has unfortunately clouded the judgement of many a critic or moviegoer, yet she may well become a filmmaking force to reckon with in years to come. The Making Of feature on the DVD is undoubtedly the highlight, a fairly comprehensive behind-the-scenes examination - exploring Madonna's reasons for making this film, as well as her (and the cast's) experience in filming 'W.E.'. Seeing Madonna talk so passionately about her project, it is something of a shame that a director's commentary is not provided. 'W.E.' is available to purchase on DVD (and Blu-ray) at amazon.co.uk, through StudioCanal UK.